Der Auslander: Why the World Hates the U.S. Despite being constantly packed with tourists, this is perhaps my favorite Starbucks simply because of the location. 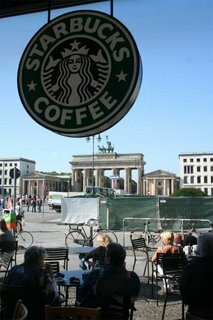 I joke with my German friends that when I'm in Berlin I stop in to get a Frappucino and then do a little American victory march through the Brandenburg Tor. Yep, sick and twisted, but good fun. I still don't know how Starbucks managed to get permission to get a storefront looking out on Germany's premier national monument ... maybe Claire had a point in her post about German Unity Day that the Germans still swallow a lot of national pride, although that was not evident in three of the four visits I made to the Auslandersamt in the past several months. The first Beamter had something to prove ... "It is of no interest to me that you have a job offer ... No job at the present time, so no Niederlassungserlaubnis" and "I don't care how much money you have in the bank." The east european she had processed just before me only had to demonstrate EUR 7,000 in the bank to support herself, but for me it was not a relevant factor. Hmmm! Then my case worker goes on her holiday, and my case is reviewed by her older colleague, who looks at my 6 years in Germany, the contract, and my bank statement and all is copacetic. I've said it before and I'll no doubt say it again, Germans on the whole have a love-hate relationship with Americans, but in the younger generations it is starting to trend more towards the latter. And Starbucks is part of the reason why they and the rest of the World seem to resent America: Coke & Pepsi are another. Germany is swimming in fizzy water. Some of it gets exported to places like America where yuppies drink it for snob appeal, although most of them go for the french or italian brands. As for America, it takes fizzy water, adds sugar, flavoring, and coloring and turns it into not one, but two dominant global brands. There are very few non-American international brands that have the scale and scope of the dozens of American brands that blanket the global landscape. That is why they hate us. The Soviets always feared the US Air Force would show up one day in the skies over Moscow. In one of those strange "They never saw it coming" moments, we knew the Soviet Union was finished when McDonalds opened an outlet in Moscow. 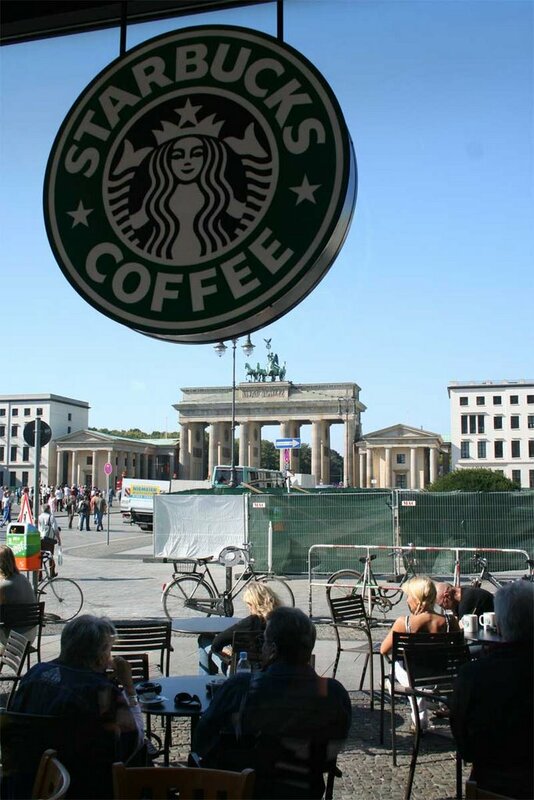 Now Starbucks has a view to the Brandenburg Tor. I'm just waiting for the day they open a shop on the Champ de Mars with a view to la Tour Eiffel just to annoy the French. Viva McDonalds & Starbucks. One world capital at a time. It's funny, I was talking about Starbucks last night. We were at a birtday party and I remarked that I want to go down to Osnabrueck to do some shopping and go to Starbucks. A friend of mine, who travels to the U.S. a lot, told me that he hates Starbucks. He thinks they are evil. I mentioned that at least Starbucks gives health insurance to their employees and that some friends in the U.S. worked there in college for the benefits. I also pointed out that they are one of the few to sell fair trade coffee. But really, I only go their to get my Venti non-fat no foam latte to go. Man, that is a lot of coffee to go! Sniff, I miss it so!